On the server-side, Go code gets compiled to a native binary, and the machine executes it. There is no virtual machine eating up extra CPU cycles. Isomorphic Go web apps provide the capability to define pretty URLs that can be easily indexed along with well-formed HTML content, that's readily consumable by bot crawlers. The Isomorphic Go toolkit provides powerful tooling to implement common functionality found in isomorphic web apps, such as client-side routing, isomorphic template rendering, and creating isomorphic web forms. Here's a live demo of IGWEB, a web application created with Isomorphic Go. You can obtain the source code for the entire demo, and learn how to run it locally here. 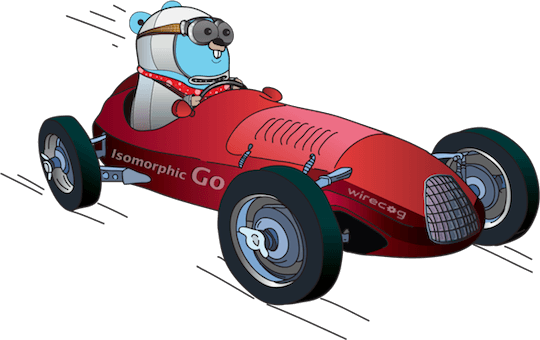 Isomorphic Go is the methodology to create isomorphic web applications using the Go programming language. Isomorphic web applications, are applications where the web server and the web browser (the client), may share all, or some parts of the web application code. Isomorphic web applications allow you to reap the maximum benefits from traditional web application architectures. They provide a better user experience, enhanced discoverability by search engines, and reduced operating costs by sharing parts of the web application code across environments. Here's an example of an Isomorphic Buffalo App created by Brian Ketelsen. Watch the video demonstrating the rendering of templates on both the server-side and the client-side. Why make isomorphic web apps with Go? Go is a modern programming language that's designed to be relevant in an age of multi-core processors and distributed systems. Unlike Node.js, back-end web server instances implemented in Go, are multi-threaded, using cheap, lightweight threads known as goroutines. Go's powerful concurrency constructs allow you to avoid callback hell, enabling you to create code that is more maintainable. "If you're building a server, I can't imagine using anything other than Go." Go includes many features that allow developers to be highly productive. Go has a simple and terse syntax which promotes readability and maintainability. Go has an implicit build system, that automates dependency analysis, which eliminates the need to manually create and maintain build files. Go comes with a robust standard library, providing a lot of useful functionality, right out of the box.